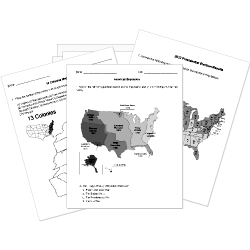 You can create printable tests and worksheets from these Grade 5 Modern Era questions! Select one or more questions using the checkboxes above each question. Then click the add selected questions to a test button before moving to another page. The highest ranking African American military leader during the Persian Gulf War. And in 2001 he became the first African American secretary of state. Who was the Wisconsin Senator that announced that there were hundreds of communists inside the U.S. government? In 1974 the Watergate scandal forced President Richard Nixon to resign from office. The internet brought the worldwide network of computers; became popular in the 1990s.